For more than 12 years, the accessibility of classic film on mainstream television has been limited to a single channel. Following the change of direction that American Movie Classics (AMC) undertook in 2002, Turner Classic Movies (TCM) has been the classic film fan’s holy grail, the one station showing classic films 24 hours a day, 7 days a week. Due to its near monopoly on the showing of these films, it has attracted legions of devoted fans and become a brand unto itself–with the annual TCM Classic Film Festival and TCM Classic Cruise drawing participants by the thousand. Now there is another channel on the market, just launched in February of this year in major U.S. cities and expanding quickly across the country, that may have all that to look forward to. GetTV, owned by Sony Pictures Television Networks, is the newest channel to make classic film programming its primary business model. Like TCM, GetTV shows classic films around the clock, but there is one significant difference–GetTV is available to viewers completely free, no cable subscription required. For this reason, GetTV shows 3 hours per week of educational programming in order to comply with FCC standards on public broadcasting, and this consists of quality entertainment directed toward a demographic crucial to the survival of classic films–children. For the vast majority of hours in the week, GetTV shows films primarily from Sony Pictures’ Columbia Library and has had in its lineup thus far such notable films as To Sir With Love (1967), Picnic (1956) and Anatomy of a Murder (1959). 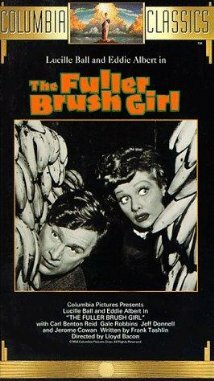 I was also thrilled to see The Fuller Brush Girl, one of my favorite lesser-known Lucille Ball comedies on the schedule a few days ago, cementing my notion that GetTV is a market force to be dealt with. For classic film lovers, this is great news. Though I have not as yet seen any silent movies on the schedule for GetTV, this doesn’t mean that silent films are off the table for the future. I would love to see GetTV tap into the lucrative silent film market, as in this way they could reach several crucial demographics–the huge community of silent film devotees that make pilgrimages every year to events like the San Francisco Silent Film Festival, the Kansas Silent Film Festival, and the Pordenone Silent Film Festival in Pordenone, Italy, as well as the deaf community, many members of which have a huge passion for silent cinema and would likely tune in as regular viewers. A scene from King Vidor’s THE PATSY (1928), a silent film that I think would work wonderfully on GetTV. Funny, engaging, and appropriate for public broadcasting, it would be a fantastic gateway film to introduce many viewers who might not be familiar with silent cinema to this beautiful art form. We have great reason to be excited about this new development in the classic film world. I will stay on the pulse of GetTV and update readers with any news. This entry was posted in Lara Gabrielle Fowler and tagged GetTV, movies, Silent Film, Sony, television, turner classic movies. Bookmark the permalink. I am so happy you are commenting on get TV, and thank you for doing the research as to why they will often cut into dialogue for a commercial break. Thanks for your comment, Kelly. I’ve heard that sentiment from many devoted fans of old Hollywood recently regarding TCM. People seem to be upset about the inclusion of newer movies on a channel that’s supposed to be “classic.” I guess it boils down to what you consider “classic,” and people have different definitions, which is kind of an inherent problem when you’re a channel dealing with what you call “classic movies.” I’m excited about Ann Miller as the icon of the week, too! Glad she’s getting some deserved attention. Given that GetTV shows exclusively Columbia product, I wouldn’t get my hopes up too high regarding silents. While the studio dates back to the 1920s, until the start of the ’30s, Columbia was strictly a Poverty Row operation, not all that different from Tiffany, Rayart or other long-forgotten outfits. Yes, Columbia made silents, but for the life of me right now I can’t think of any of note. GetTV isn’t so much a rival to TCM as it is a complement (I’d be rather surprised if it gained rights to air films from other studios), and I hope its creation doesn’t mean Columbia will deny TCM access to its many titles. Fox Movie Channel continues to exist (though it’s changed a bit in recent years), but Fox has worked out agreements for more of its films to air on TCM — such as tonight’s “Essentials” selection, “Laura,” a premiere on the channel. If I was stuck with Deadliest Catch and Duck Dynasty showing I be cutting the cord of Verzion FIOS can’t do it right now LOL! It’s not going to show exclusively Columbia movies for long. It’s in the process of negotiating with studios for licensing, and at which time, I hope they’ll get some silents on board. I can’t imagine that Columbia wouldn’t license its films to TCM–as you said, GetTV is a complement rather than a rival. And it’s not nearly as huge as TCM is, it’s still a teeny tiny outfit that is still getting its feet wet. LAURA is a premiere on the channel?? That can’t be. Maybe a new restoration of the movie is premiering? I attempted to view a couple of the films I was interested in on GetTV a week ago and was surprised to see that those films were cut. Just tried this again today with “The Long Haul:” a film with the running time of 100 minutes. After the film was over I checked what the length of the film was after the commercials were cut and only 88 minutes were there. Not that all the films that they show are cut – but out of the 5 I looked at – 3 were but and not by a minute or two. Hence I am alerting my many film collecting friends to be wary now of GetTV. Wow, that’s good to know. I’ll have to look into that. GetTV is commercial TV first, and movie TV last.